The warp-weighted loom uses a system of holding the warp threads parallel under tension by tying them in small bunches to weights made of stone, pottery or metal. 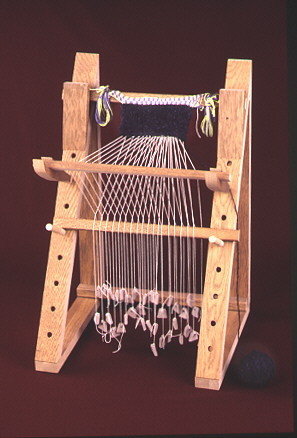 From the beginning of Western history until the Middle Ages, the main weaving tool was this type of loom. Loom weights have been found in Catal Huyuk, an ancient city in Anatolia that dates to 7000 BCE, and use of the warp-weighted loom persists to the present day in part of Norway. Although its particular form has varied through the ages and by locality, its essential parts remained the same. The loom consists of two vertical uprights, a horizontal warp beam, a shed rod, a heddle rod, and weights. The warp threads are tied to the horizontal beam at the top and hang down vertically towards the ground. The weights, in this case, made of clay, are then attached to the ends of the warp threads, which are then grouped together and tied so that the spun threads don't untwist. The warp-weighted loom greatly increased weaving efficiency and allowed weavers to create huge, magnificent works and tapestries.